God is sovereign of the entire universe. He plans what he plans and He does what he pleases. It’s admittedly hard to understand how God can and does orchestrate all events at once, constantly, over the earth and throughout the stars, so that His plans providentially combine in perfect harmony to enact His will. But He is God and we’re not supposed to understand it! It is also hard to understand how our personal decisions are still personal but also are part of His will and plan and the outcome is predetermined. That our decisions are our own yet are part of a pre-ordained plan that all leads to the cross and beyond is a tension our finite minds can’t comprehend. It is a joy to ponder them though, because in so doing, we come up against God’s power, omniscience, and will. Here are two things to consider when looking at God’s providence and will, with our decisions and will. “For if you keep silent at this time, relief and deliverance will rise for the Jews from another place, but you and your father’s house will perish. And who knows whether you have not come to the kingdom for such a time as this?” (Esther 4:14). Esther could make her own decision. She could risk her life and go in to the King, or she could stay in the harem and not go to the King. Mordecai knew God’s character well enough to know that His promise to keep a remnant of His people alive would indeed happen, whether Esther decided to participate at this particular moment or not. God would keep His promise no matter what Esther decided. The choice was hers. Esther decided to go in and speak to the King even though he had not called for her (usually this meant death). We know the rest, Esther’s action revealed to the King the evil deeds of Haman and Haman was killed instead of the Jews. Jael was the wife of Heber the Kenite. Sisera had been cruelly oppressing the Hebrews for 20 years. The people cried out. Deborah was civic leader at that time, prophesying and judging. She sent for Barak, the military leader and told him to go take care of the problem. Barak could freely decide what to do. He could go or he could not go, the choice was his. He said he would not go unless Deborah came with him. (Judges 4:8). His answer was in effect, no. Deborah replied that she would go with Barak, but it would be an embarrassment to him because God would deliver Sisera into the hands of a woman, and Barak would not get the military glory for the victory. Barak freely made his choice, but now the outcome would occur from another quarter, just as Mordecai had said it would if Esther decided against her action. Into the story enters Jael. After Barak routed Sisera’s army, Sisera fled. Sisera aimed toward the tent of Heber the Kenite. Sisera knew there was peace between Jabin the king of Hazor (Sisera’s King) and the house of Heber the Kenite. Heber had separated from the Kenites and was settled far from the action. Sisera ran, believing he was safe to go toward the area where there was no fighting and where there was peace between the parties. Normally he would be right, especially since hospitality customs were so strong in protecting those who are invited into the tent. However in this providential case, Sisera was wrong. Jael invited Sisera into the tent, gave him drink, and covered him as he fell asleep. Note that Sisera fell asleep. He had a hard day of fighting, but even though his life was in peril he felt comfortable enough where he let down his guard and fall asleep. 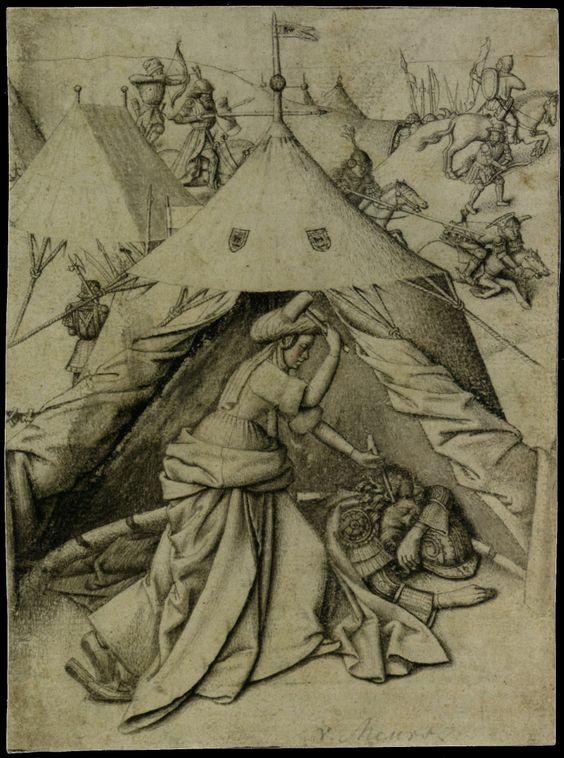 Women in those days were responsible for pitching the tents and so Jael was strong enough and familiar enough with how to efficiently hammer a tent peg into the ground. As Sisera slept, she drove a tent peg into his temple and pinned his head to the ground. The verse succinctly states, “So he died.” (Judges 4:21b). And behold, as Barak was pursuing Sisera, Jael went out to meet him and said to him, “Come, and I will show you the man whom you are seeking.” So he went in to her tent, and there lay Sisera dead, with the tent peg in his temple. 23So on that day God subdued Jabin the king of Canaan before the people of Israel. (Judges 4:22-23). Barak had kind of said “I will go” but not really. Placing conditions on your obedience isn’t really obedience to God. I like how the verse says God subdued Jabin. Whether Esther went in or didn’t go in, God would deliver the Jews from Haman. Whether Barak went to battle or didn’t go to battle, God would deliver the Jews from King Jabin and Commander Sisera. Both Esther and Barak freely decided on a course of action. Yet both outcomes occurred at the providential hand of God. This is excellent; one of the best paragraphs you’ve ever written, IMO.